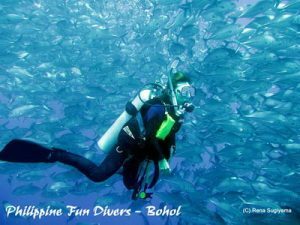 On this page: Scuba Diving and PADI Dive Courses in Alona Beach, Panglao Island, Bohol, Philippines. 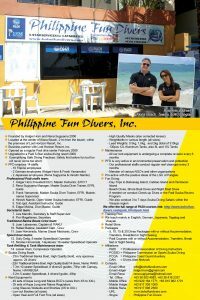 Scuba diving and island hopping with Philippine Fun Divers – we are the experienced and highly professional operating PADI 5 STAR RESORT PADI 5 STAR DIVE RESORT in Bohol and offer scuba diving, PADI Dive Courses, beach resort accommodation, dive safaris and dive travel in Alona Beach, Panglao Island, Bohol, Philippines. 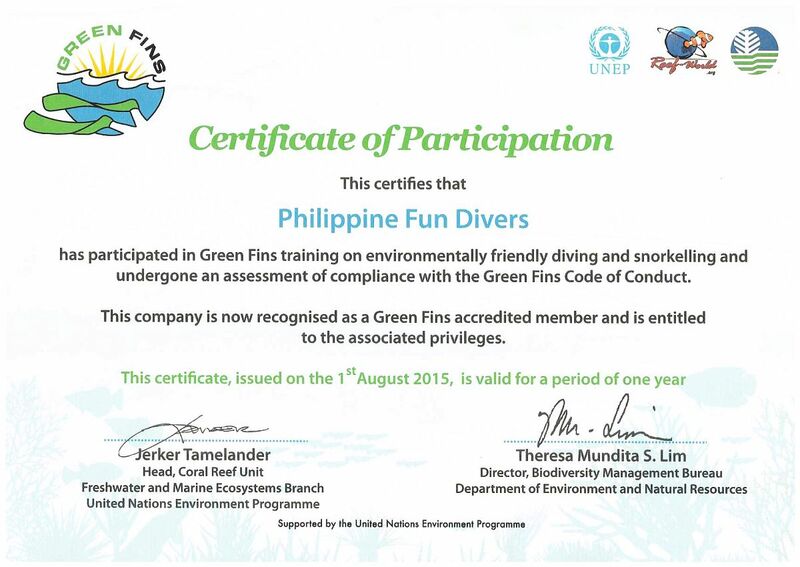 Philippine Fun Divers: All Scuba Diving related activities are our specialties. 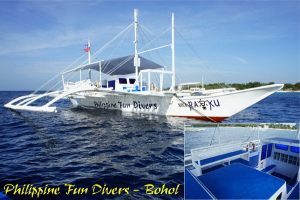 Next to planning your scuba fun diving day trips we conduct the full range of PADI Dive Courses and Specialty Courses and let you experience selected dive destinations while enjoying our famous Visayas Scuba Diving Safaris. 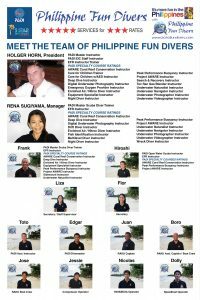 We arrange your round-trip transfers from Cebu and Tagbilaran and accommodations with Lost Horizon Resort or other selected beach resorts. 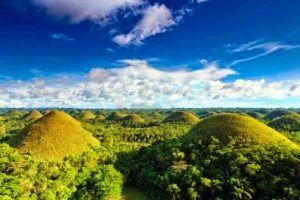 We organize day-trips to the Chocolate Hills and other destinations in and around Panglao Island, Bohol. 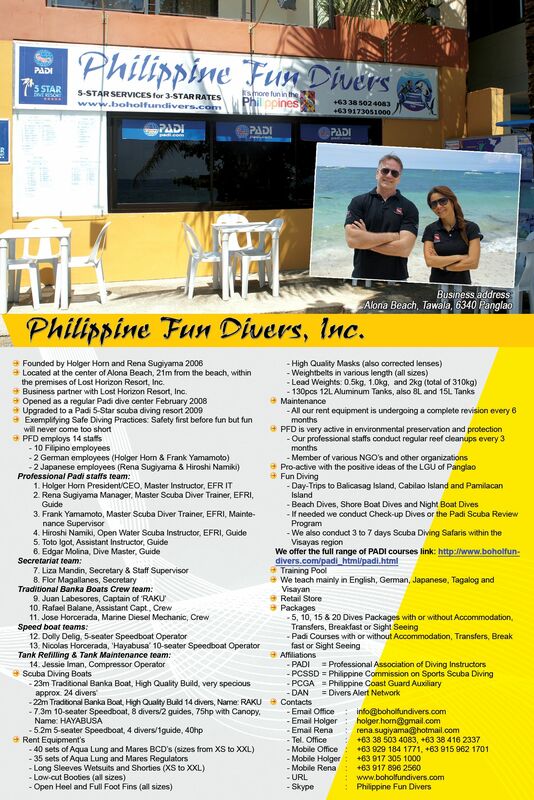 Philippine Fun Divers, one of the only few PADI 5-Star Dive Resorts in the area is under German/Japanese management. Holger Horn, PADI Master Instructor, EFR Instructor Trainer and the President of PFD and Rena Sugiyama, PADI Master Scuba Diver Trainer, EFR Instructor and the Manager of PFD have great business and diving experiences in Bohol and other parts of the Visayas. Panglao, Bohol offers some of the best dive spots in the Philippines. Even the house dive is an exciting wall dive, covered with colorful hard and soft corals. In Balicasag, just a 35min boat trip away, turtles, school of Jack Fishes, Barracudas and other pelagic fishes awaits you. Colorful reef dwellers like trumpet-, parrot- and cuttlefish, angel fishes, bat-fishes and much more are found during every dive. Escape to a different world. Scuba diving takes you to a different world with new colors, shapes, textures and creatures – a world where the roles you play – husband, wife, mother, father, friend – take on a new dimension. Become a scuba diver and escape to a peaceful place to renew your energy and excite your senses. 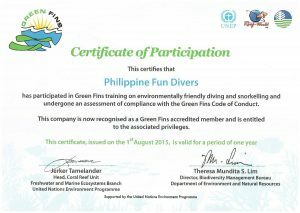 We here at Philippine Fun Divers, a PADI 5 Star Dive Resort, offer the whole range of PADI dive courses from beginner to the professional. 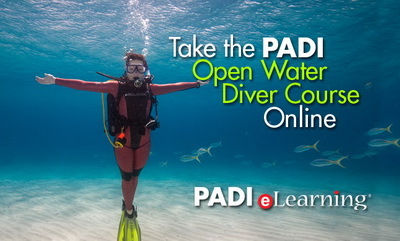 We teach scuba diving… the fun way. 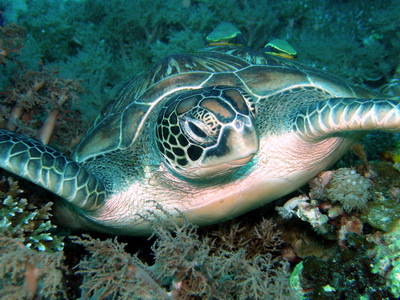 A trip to Apo Island in Negros from Alona Beach, Panglao Island can be done in two days. The whole Island is a marine park and has great dive spots to offer, i.e. Mamsa Point, Chapel and Coconut Point among others. The package includes 4 dives and a 5th dive could be added as a night dive. A minimum of 6 divers are required. 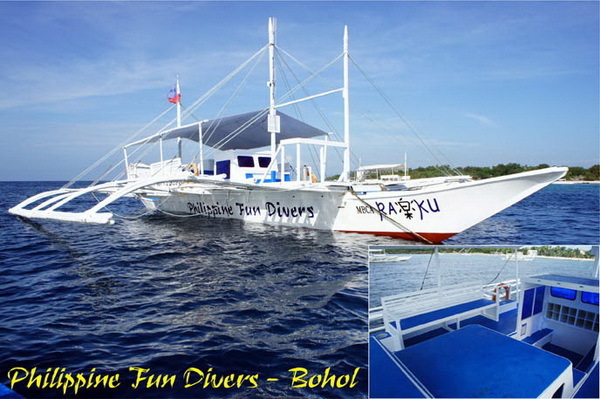 As often as possible we organize a day trip to Cabilao Island for 2 to 3 dives. It takes us about 2 hours to get there. The departure time is around 7a.m./07:00h. 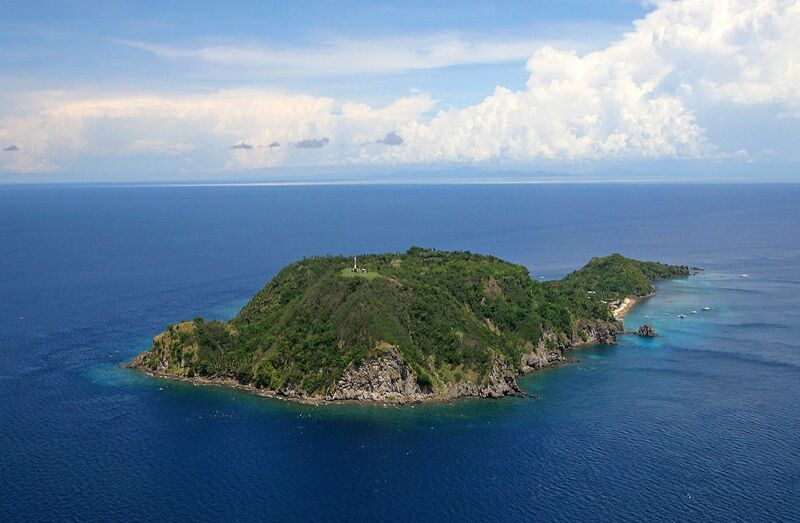 Cabilao Island is famous for its fantastic walls and a great eco system. A minimum of 5 divers are required. Once 5 divers signed up, we are good to go. Either signing up will take place one day before departure or if a minimum of 5 divers are planning ahead of time, we could set up a fix date. Join us on a wonderful day-trip to the Chocolate Hills. During this trip we will also enjoy the Loboc River on a floating restaurant, visit the Philippine primate Tarsier and the two Bamboo hanging bridges. More info’s regarding this and other trips under the link Adventure Trips.